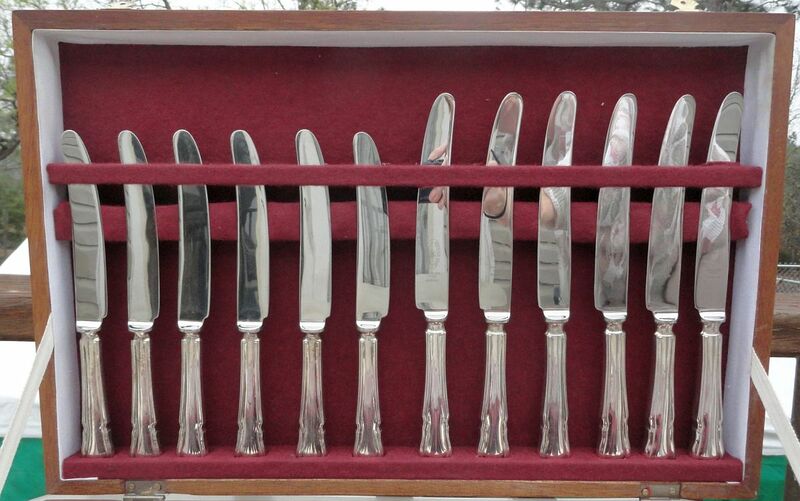 6 Table Knives, Hollow Handle, with bolster, 9 1/2"
6 Table Forks, 8 1/8"
6 Dessert Knives, Hollow Handle, with bolster, 8 1/2"
6 Dessert Forks, 7 1/4"
6 Fish or Salad Forks, 6 3/4"
6 Fish Knives, 8 1/8"
6 Soup Spoons, round, gumbo, 7"
6 Dessert or Soup Spoons, oval, 7 1/4"
6 Five O'Clock Spoons (for tea or coffee), 5 1/2"
2 Table Serving Spoons, 8 1/2"
A classic Victorian style pattern, this elegant design inspired by Chippendale furniture styles is produced by Original Sheffield. The exact year it was introduced by this maker is not known but it is still being produced in Sheffield, Yorkshire, England. The stainless steel knife blades are made by the venerable old cutlery maker Atkinson Brothers of Sheffield. 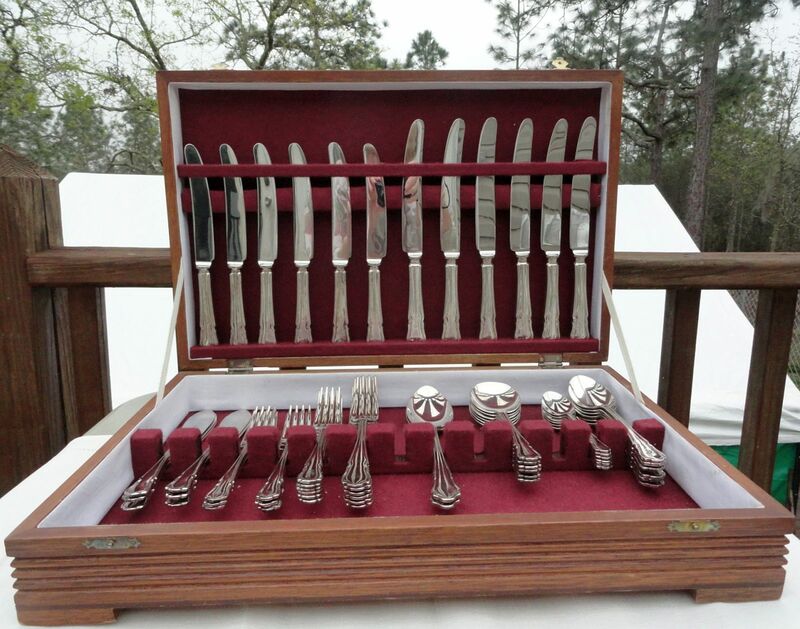 The deluxe 56-piece service offered here is in never-used condition, ideal for gift giving. Did you know that there is now a very limited silver flatware manufacture in Sheffield, England? Many companies that used to manufacture there are now in the Orient. 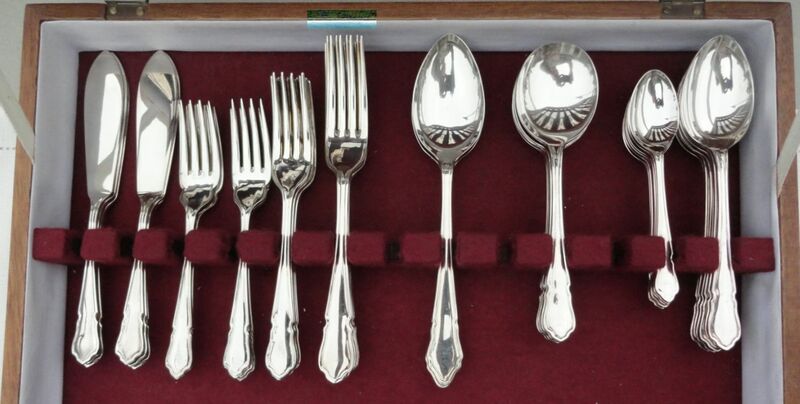 Genuine Made In Sheffield, England silverware is getting ever harder to find. Compare prices for NEW production in Great Britain here . Please note that the standard U.S. shipping charge of US$7.00 included in the PayPal Shopping Cart checkout applies to this offering and should be considered an additional bonus. Outside the U.S. individual international shipping charges apply and will be advised at time of order. Email or call Liz to work with you on your requirements.